Sometimes the standard AXIOM exports are just not enough. CART cannot report on data if an AXIOM export does not generate it. DART provides an easy way to execute ODBC calls without programming. 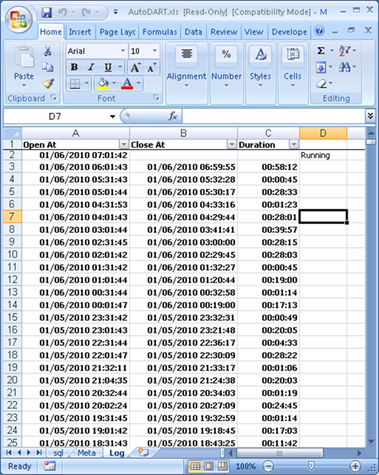 Simple edit a table and create a Windows Scheduled Task to execute DART at the desired frequency. The resultant DART files can be used stand-alone, or automatically merged with AXIOM exports to enhance CART reports. One starts by assuring the AXIOM ODBC driver is properly installed on the computer running DART. Then one completes a table in DART with the ODBC parameters. Column A contains either the name of the database to query or the word "Update". If "update" is present, DART opens the file in column F and executes an "Update" macro located in that file. These are typically customized reports that need periodic updating. Column B lists the SQL code to execute. Column C specifies how often the SQL code is to be executed. Column D lists the last time the SQL code was executed. Column E lists when the next execution is due. If the background color of column E is pink, then the execution is overdue. Column F is the output file. Column G if not blank lists the Post Query Routine to execute to further massage the data. Column H lists the start time of the most recent execution. Column I lists the duration of the execution. Note Cell (I10). This query takes over 2 hours to execute! The cis.mfg-invh table is quite large and the Progress indexes on that table are not very useful. One ongoing project I have is to determine how to better extract information from this table. Stay tuned. A log file tracks the duration of each DART cycle. In this case, DART fires every 30 minutes. Note row 8, the DART queries took longer than 30 minutes because several were due simultaneously. Also not row 4, where DART only ran for 45 seconds because there was not much to do at that time.